What better way to spend an evening than painting up a brand new model. Thanks again to the Ansells, who generously provided these pleasing mementos of the Oldhammer 2014 weekend. 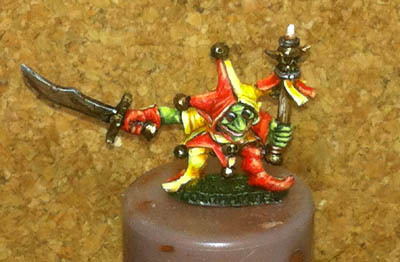 He has been painted in red and yellow as these are not only classic jester colours, but also those of the Foundry logo. Nice mini and an appropriate paintjob to boot. Great work on a beautiful miniature- I salute you, the Goblinmaster and the Ansells! Great stuff. Like the colour scheme. Cool PJ on the Gobbo.